Be Well. Be Healthy. Be You. FEST! 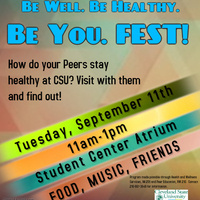 Visit your CSU peers and other campus support partners in the Student Center Atrium to find out how to "keep your healthy" at CSU! Participate in a yoga demonstration, neck and shoulder massage, listen to music, enjoy some healthy food and engage with friends.